Bear fills his day with food, funny jokes, tricks on his friends — and an escape right off the page when they all chase him in pursuit! With jaunty rap-style rhyme, first-time children’s author Ben Bailey Smith joins debut illustrator Sav Akyuz for a picture book starring a lovable, slightly naughty bear whose antics will have young children smiling in solidarity. Ben Bailey Smith is a U.K.-based rapper (known as Doc Brown), an actor on the British edition of Law & Order and the British kids’ show 4 O’Clock Club, and a stand-up comedian. Now he adds a new facet to his career: children’s-book author. He lives in London. Sav Akyuz is a first-time children’s-book illustrator who has worked as a storyboard artist on TV programs and feature films. He lives in London. Mixing the melodies of hip-hop with the antics of preadolescence makes this colorful picture book a charming read for young rap fans and beginning readers. An interesting mix of adorable and aggravating, Bear and his high energy will liven things up when read aloud. 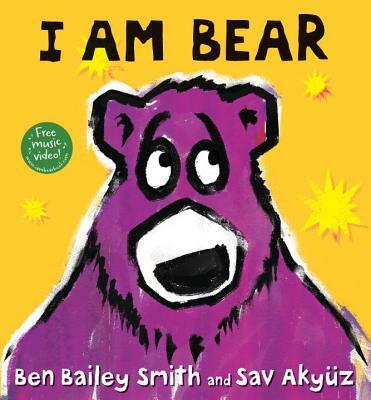 British actor, rapper, and comic Smith's foray into children's books introduces a large purple bear with a knack for mischief...It's a zippy, over-in-a-minute escapade, but Akyuz's vibrant, painterly images and the sheer force of Bear's personality make a distinct mark.